This beautiful baby dress by Cassie Ward is packed with pretty colours and texture. 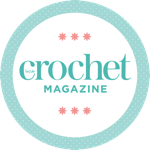 This stunning pattern's available inside issue 99 of Inside Crochet. Not a subscriber? Order a copy online today or download our digital edition directly to your smart device in just a couple of minutes. Designer biography: Cassie loves to crochet clothing for children. She prefers bright styles, breaking away from the stereotypical pink for girls!